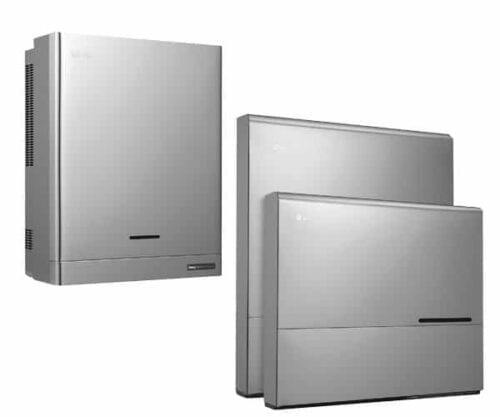 The LGE ESS Home 8 with 7kW Li-Ion Battery Storage Package (LG HB 7H) is a battery storage for self consumption. LG’s DC-coupled ESS converts electrical energy more efficient than AC-coupled ESS. This allows the LG ESS to achieve higher efficiency. In addition, the LG ESS generates three-phase alternating current, so no unbalanced loads can occur. About an additional Switch box can ensure the emergency power supply become. The web monitoring function enables the Installers and users the system status anytime and to check from everywhere. Qualified switch box (Enwitec) to Ensuring critical consumers Power failure. Optional component. Three MPP trackers allow for a high degree of flexibility the module assignment. The battery storage can be in sized 7-9.8-14-16.8 -19.6 kWh packages. Elegant design and coordinated Appearance through stainless steel case.Higher stability instead of plastic housing. System monitoring enables increased PV consumption for greater independence. Compatibility with LG heat pump. LG Chem Ltd. often referred to as LG Chemical, is the largest Korean chemical company and is headquartered in Seoul, South Korea. According to Chemical and Engineering News, it was the 13th largest chemical company in the world by sales in 2014. It was first established as the Lucky Chemical Industrial Corporation, which manufactured cosmetics. It is now solely a business-to-business company. The company has eight factories in South Korea and a network of 29 business locations in 15 countries. LG Chem completed development and began mass production of Korea’s first lithium-ion batteries back in 1999. At the end of 2011, LG Chem was the world’s third-largest maker with an annual production capacity of 1,000 million cells. It is also a supplier of automotive battery for electric vehicles. Visit us on Facebook or join our ZERO Home Bills Community. BEST Products from the BEST Brands at BEST Prices for ZERO Home Bills on ZEROhomebills.com by Solaranna.